There’s an array of trait possibilities which form our personalities and make each of us unique. This is as true for animals as it is for humans. Pet owners will tell you that dogs from the same litter can differ tremendously: each pup brings its own unique combination of characteristics into the world. 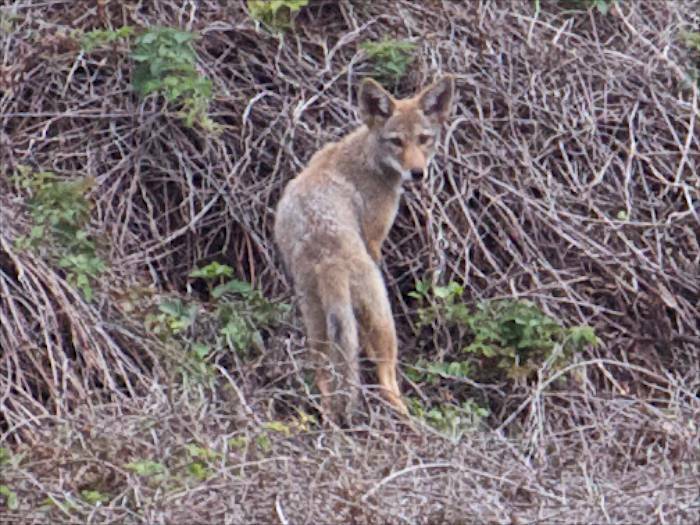 And coyotes, too, are unique individuals. I’ve seen this particular litter three times now and I’m seeing behavioral differences which distinguish each pup. The top photo shows pups who are rough and tumble and full of play. They like to run pell mell after each other — tumbling over each other and getting all tangled up is part of the fun. Diametrically opposed is a very little reserved and careful pup. This one sat back and watched as the others roughhouse and play fearlessly. When she noticed me, she hid behind a tree. She? Of course I don’t know, but that would be my guess based on her comparative smallness and daintiness. I wonder if she is a runt. And then, there’s the adventurer who is curious and explores far-off distances alone — probably unbeknownst to his parents who are still trying to keep the pups’ existence a secret. I’ve caught him — he stands out as being larger and stronger than the others — on my field camera not anywhere near where I’ve seen the others: exploring and examining the territory, totally on his own. I’ve also spotted this one sleeping on his own out in the open, which is something his parents do, but not his siblings. This one seems to be exceptionally bright, inquisitive, and self-sufficient — at least comparatively. Just hope he doesn’t get himself into trouble early on by wandering so far off from the rest of them in this litter. These pictures are of Dad escorting his puppies in June 2010. He saw me, perceived me as a threat, and stopped. Although not all are pictured, he had at least three puppies with him. One of the puppies didn’t stop when Dad stopped. Instead it got ahead of him and paused briefly. “One Pup Gets Forward” has the wayward puppy partially concealed in the lower left. Then the wayward puppy went forward, kept going, and got well out of Dad’s reach many yards away. Dad did not follow the wayward puppy. “Dad Can’t Follow It” pictures Dad angry because one of his puppies got away. A different puppy clings to Dad. Dad retreated with the rest of the puppies. Way too late for my comfort, the wayward puppy galloped back and caught up with Dad. I’ve never since seen a cute little coyote puppy run that fast. It was galloping as fast as a rocket, so earnestly wanting to be with Dad. I was ecstatic. 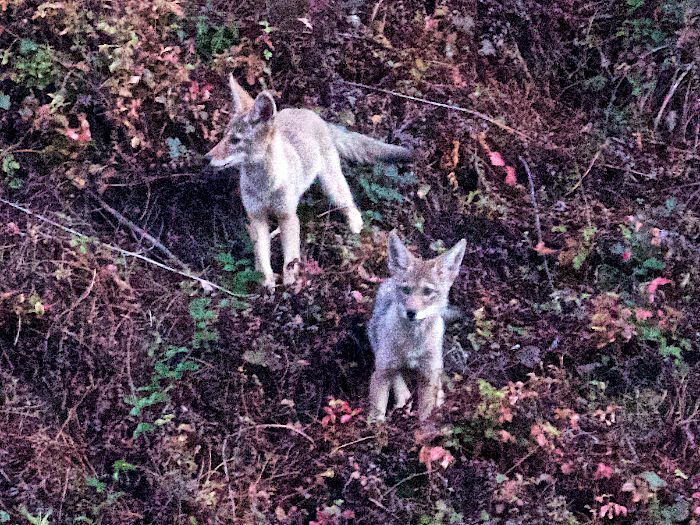 I had again been able to take pictures of a coyote father with his puppies. When I returned home I studied the photographs and also studied photographs taken on previous days. My study led me to some conclusions. Generally Dad is cautious and expects danger when walking around. When Dad perceives a threat he makes an assessment and then takes action. With puppies in tow, Dad has fewer choices of action. Puppies are rambunctious and take effort to control. With puppies and perceiving a threat, there isn’t much Dad can effectively do other than to collect them and retreat. Usually when they all came across me, the puppies noticed when Dad stopped and became cautious too. Cautious, the puppies held still, went to Dad, to each other, hid, or went back in the direction they all came from. The puppies were also curious and looked in my direction to see what Dad’s fuss was all about. When all were somewhat settled, Dad led a retreat. Note that with puppies, when Dad perceives a threat he expects good behavior from his children and usually gets it. Unfortunately, this time one of the puppies didn’t get the “caution” message. One puppy kept going forward alone, getting somewhat far away. Initially it stopped, but it wanted to keep going and it did! This time Dad’s circumstances weren’t usual because he had a very poorly behaving puppy! Yet Dad has situational intelligence and so do I. As I studied the photographs, I thought Dad had to understand that he couldn’t be in two places at the same time. Indeed, he looked toward the wayward puppy and appeared to be stymied, exasperated, resigned, composed, in charge, and as if saying: “I told you to stop.” Then Dad, still looking in charge, lifted his head toward me, the cause of his dilemma. After studying the pictures, I realized just how angry Dad was. Why? It hit me and I was stunned by the thought. Dad was angry with me for separating out a puppy and he was angry because he couldn’t protect them all. In his mind, I had intended to cull one of his young. In my mind, I was but only watching a show. In Dad’s mind, I had won and he had lost a lot. He carried that look of frustrated hatred, a look that comes with a defeat. In Dad’s mind, one puppy was beyond his protection, liable to be taken by a predator. I think he knew the situation required him to sacrifice one puppy for the safety of the others. Dad couldn’t protect the rest of his flock if he went to help one vulnerable puppy. He loves all his puppies and that day Dad knew he had to let one go. I caused it and Dad was livid. Yet he accepted the situation and acted prudently. Dad offered one of his children up so he could protect the rest. Until I arrived home to excitedly review my pictures, I thought I had been watching a show complete with cute puppies. At home with the photographs, I felt remorse. It wasn’t a show. To Dad, it was as real as life gets, life for which he strives to prepare his young. As a boy my friends and I talked as we rambled. Yet most of our communication was body language. We spoke about what we had just done. Talking contributed least to the communication. Most of our communication consisted of touching things and bumping and hitting each other. It was sublime. Dogs, wolves, and coyotes viscerally connect in the same way. Dogs and children instinctively know how to play together. They read each other’s constant motion. Each is physical and energetic. My dogs jostle around together. They do focused sniffing, reading smells. Their vocalizations are infrequent declarations. They competitively pee. They alert when seeing rodents, ecstatic and wanting to chase. They stare up at treed squirrels for as long as I allow. If something moves elsewhere, they tell each other with gestures and barks. Never far from each other, they notice gait, posture, hesitations, head direction, tail position, every small change, and minutiae we will probably never see, smell or hear. One night, I watched six dogs outside a dog park chase what at first appeared to be a cat. The dogs packed after the animal and treed it. They could have caught it. It was clear they didn’t want to. They didn’t even bother the animal when it was up in the tree. Chasing it, getting close to top speed, a quiver went through all the dogs. They pulled back just a enough. A flash of rump suggested they were chasing a bob cat. That information passed from dog to dog. The chase turned into a show. The dogs tried to conceal from their owners that they hadn’t done their best. Instead they had made a mock effort. There was face saving going on in that group that night. There was also a lot of palpable nonverbal communication. I watched a documentary on wolves hunting deer. The humans were mystified. How did the wolves decide which of the deer to hunt? They studied the film. Eventually they saw that one of the deer was slightly lame. They agreed a human couldn’t easily see that tiny weakness in a running deer. The wolves spotted the deer’s injury. The decision by the wolves passed through the group in much the same way that those dogs each decided to not chase a bob cat. Canines are attuned to subtle variations in movement. Movement is rich with information and canines have excellent spatial intelligence. For example, my dog Holtz remembers exactly where he saw cats while on our walks. He remembers regardless of when we last passed by. His demeanor anticipates arriving at a known cat’s range. I suspect Holtz has high value points mapped out. He zones in on an area when far from it, suggesting he relies on memory. For Holtz, a walk is a milk run with known special stops sprinkled along the way. He has also learned the local watering holes and drags me to them on our walks. On hot days he uses them to get soaked. At a large park nearby, we always enter on the side opposite a ground squirrel colony. The colony is a quarter mile away and over a hill. Holtz has little interest going anywhere except the colony. A mile from the park, while walking along a street parallel to it, he tries at every cross street to go there. I don’t doubt he could travel alone from our house to the colony four miles away. It is a place he sees in his mind’s eye. He has a mental map to the park. It is a place remembered as opposed to one merely in his sight. Would he get the idea to go there alone? I don’t know, but he can form intent. I observed Holtz act with situational intelligence at a dog beach. We were there with Lucas, his German Shepherd buddy. Holtz was off leash romping and I was working hard to control Lucas with a leash. Holtz flew by, looked at us, and clearly had an idea. He bounced over and began herding Lucas. Holtz calmed Lucas down with body checks. I don’t know if Holtz’s idea was to help or to just have fun. Either way, he read the situation and resolved the conflict. Another example of Holtz forming intent is his use of guile. He will pretend he wants to drink water from a stream so he can get off leash. Instead of getting a drink, he’ll run to a distant high value area. A more common example of canine guile is selective listening. In certain situations they pretend not to hear us yelling their names. Holtz remembers interesting places and is able to form intent. He knows his way around. In cities, with reasonable restrictions on dogs, we may forget that country dogs roam and return home. In cities it is somewhat novel to see a dog out walking itself. “Out walking itself” is an odd phrase considering that walking around is what dogs do. Coyotes do it with such style I almost forget dogs are equally skilled. 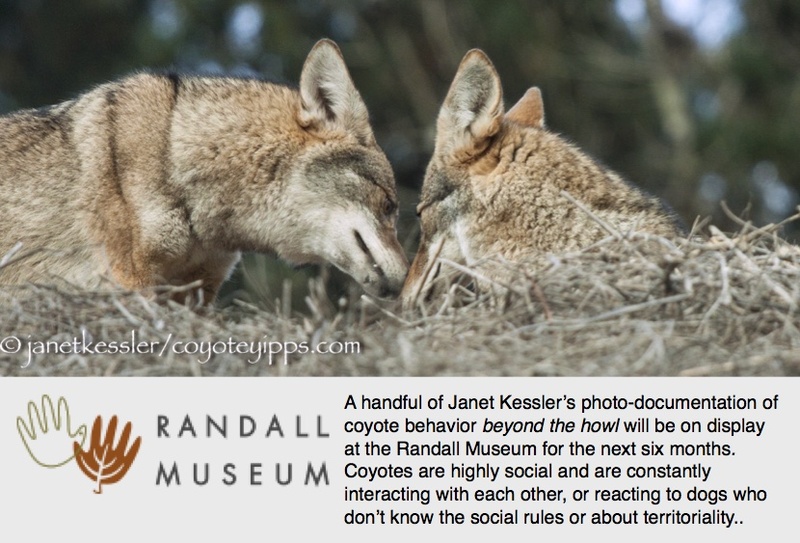 Coyotes form intent, know interesting places, and remember them. With keen spatial intelligence they know their way around. They know where they are going and they know why. They seek food, water, information about their neighbors, safe resting spots, shade, warmth, and novelty. They make their rounds looking for intruders, making sure the doors are locked. They look for each other seeking companionship, family, play, and security for themselves and for their children. We see them out and about, exuding purposefulness. It is hard to exactly know their purpose on any particular occasion. It is safe to say their purposes aren’t significantly different from our own.